Please could you start by telling us a little bit about what you do. I am a Fine Artist. The role of the artist is a unique position – one that can illuminate and affect society. As part of my artistic production I created a celebrity. I constructed her out of signs and symbols that point to modern day myths. 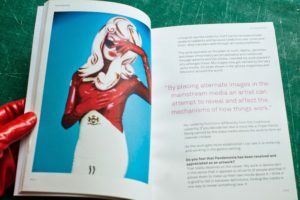 By exhibiting my celebrity “Pandemonia” at events such as fashion shows, product launches and art openings, my image and ideas have spread virally through the media. 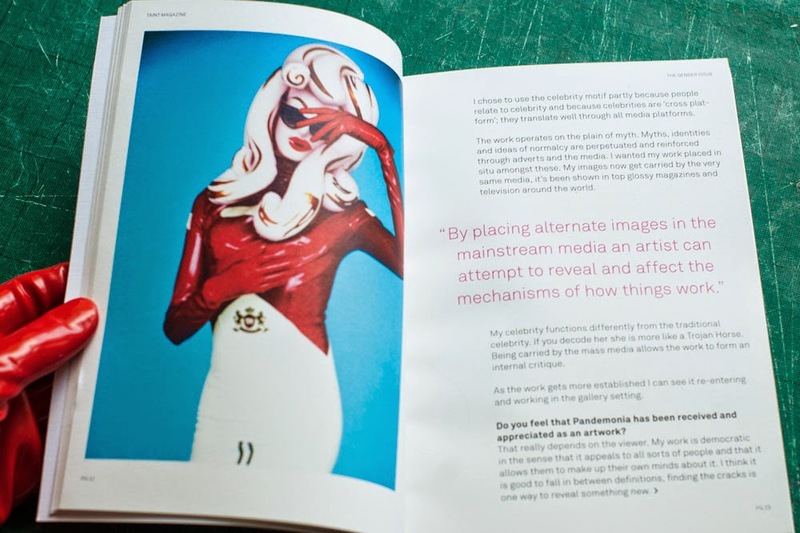 Pandemonia is an artistic intervention. At fashion shows there is a strict hierarchy which dictates who sits where. I had no idea how the ‘powers that be would react. When I arrived, the press photographers, the audience and security spontaneously began performing ‘Pandemonia’. Pandemonia was photographed by the press pack and placed centre front row. 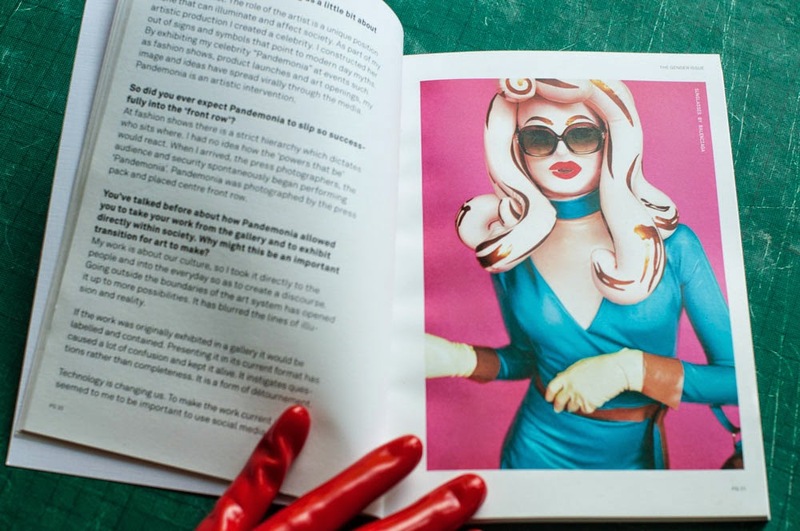 You’ve talked before about how Pandemonia allowed you to take your work from the gallery and to exhibit directly within society. Why might this be an important transition for art to make? My work is about our culture, so I took it directly to the people and into the everyday so as to create a discourse. Going outside the boundaries of the art system has opened it up to more possibilities. It has blurred the lines of illusion ans reality. If the work was originally exhibited in a gallery it would be labelled and contained. Presenting it in its current format has caused a lot of confusion and kept it alive, It instigates questions rather than completeness. It is a form of détournement. Technology is changing us. To make the work current it seemed to me to be important to use social media. I chose to use the celebrity motif partly because people relate to celebrity and because celebrities are ‘cross platform’; they translate well through all media platforms. The work operates on the plain of myth. Myths, identities and ideas of normalcy are perpetuated and reinforced through adverts and the media. I wanted my work placed in situ amongst these. My images now get carried by the very same media, it’s been shown in top glossy magazines and television around the world. My celebrity functions differently from the traditional celebrity. If you decode her she is more like a Trojan Horse. Being carried by the mass media allows the work to form an internal critique. As the wok gets more established I can see it re-entering and working in the gallery setting. Do you feel that Pandemonia has been received and appreciated as an artwork? That really depends on the viewer. My work is democratic in the sense that it appeals to all sorts of people and that it allows them to make up their own minds about it. I think it is good to fall in between definitions, finding t5he cracks is one way to reveal something new. The democratic appeal of Pandemonia is something I found initially interesting about the work. Where contemporary art can often be conceptually elitist, Pandemonia appeals to masses as something else entirely. The very same media who did not recognise Tracy Emin’s bed as an artwork appear to have welcomed and promoted Pandemonia as a celebrity. That is how a Trojan Horse works, it appears as one thing but inside it is something else. Our ‘guardians’ – those who choose what to report – accepted Pandemonia with open arms. I wanted the work to get good exposure because it relates to what is going on in culture now, not to just the select few. 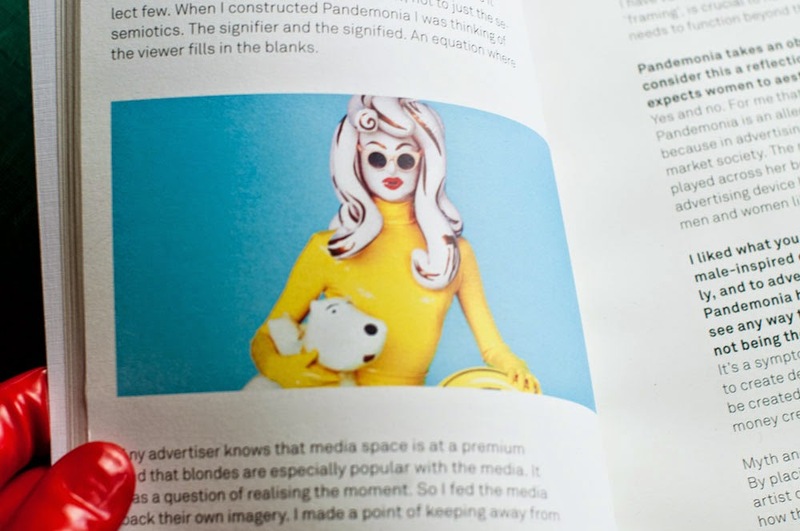 When I constructed Pandemonia I was thinking of semiotics. The signifier and the signified., An equation where the viewer fills in the blanks. Any advertiser knows that media space is at a premium and that blondes are especially popular with the media. It was a question of realising the moment. SO I fed the media back their own imagery. I made a point of keeping away from exhibiting in the gallery. 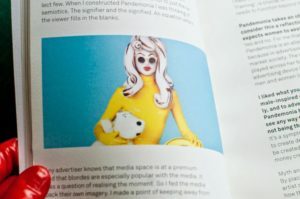 I showed Pandemonia in non elitist places where it would give the press an easy narrative to write around. She is the perfect blank canvas to hang stories off of. You touched on the possibility of the work returning to as gallery context. Is this something which may happen soon? I have various projects in the pipeline. The context, or ‘framing’, is crucial to how the work is perceived. The work needs to function beyond the walls of the gallery. 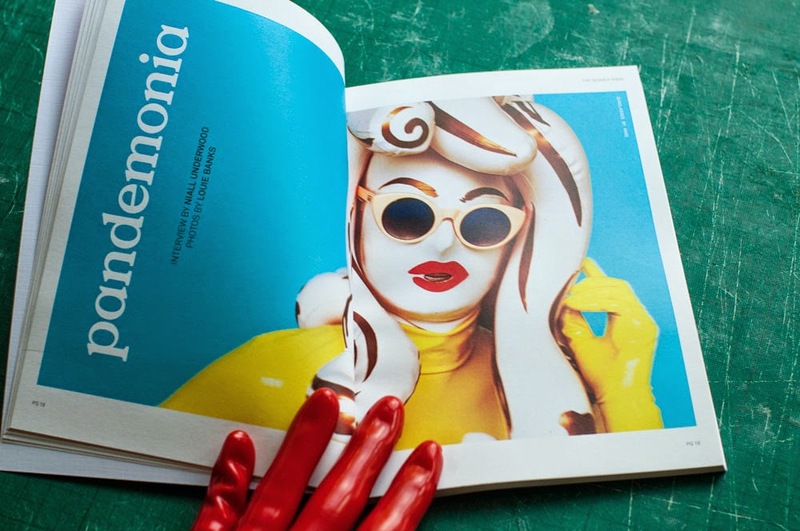 Pandemonia takes an obviously female form. Do you conciser this a reflection on the way in which the media expects women to aesthetically please? Yes and no. For me that is too simplistic an interpretation. Pandemonia is an allegory. I chose to make her female because in advertising the Female is the emblem of our market society. The myths and aspirations of our times are played across her body. Her image is the most effective advertising device known to mankind. Her image sells. Both men and women like to look at her. I liked what you said about market society; this fe-male-inspired emblem does seem to be used relentlessly, and to advertise such a vast quantity of products. Pandemonia has responded well to this idea, but do you see any way that we, as a society, can move towards this not being the case? It’s a symptom of the capitalist cycle. Advertising functions to create demand where there is none. Demand needs to be created to pay debt, Debt is the driving force behind money creation. Myth and Image are the motivators behind our desires. By placing alternate images in the mainstream media an artist can attempt to reveal and affect the mechanisms of how things work. This entry was posted in Articles and tagged LOUIE BANKS, NIALL UNDERWOOD, Nu pop, Pandemonia, Post Pop, Taint, Taint Magazine.